EuroMillions is a transnational lottery, launched on 7 February 2004 by France's Française des Jeux, Spain's Loterías y Apuestas del Estado, and the United Kingdom's Camelot. The first draw was held on Friday 13 February 2004 in Paris. Initially, only the UK, France, and Spain participated, with the Austrian, Belgian, Irish, Luxembourg, Portuguese and Swiss lotteries joining for the 8 October 2004 drawing. Draws are held every Tuesday and Friday night at 21:45 CET in Paris. A standard EuroMillions ticket costs €2.00, £2.00 or CHF3.00 per line played, depending on the local currency. (An option, called Plus, currently available only in Ireland and Portugal, adds €1.00 per line.) 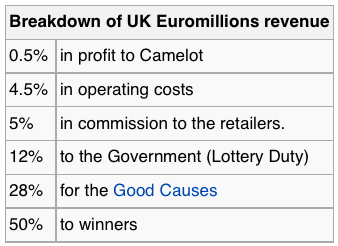 The cost of playing in the UK increased from £1.50 to £2.00 per line on 7 November 2009, due to the combination of: the EUR/GBP exchange rate, and an automatic entry in its Millionaire Raffle. All prizes, including the jackpot, are tax-free (except in Switzerland) and are paid as a lump sum. Any person 18 or over who resides in a participating country. The minimum age differs in some countries, e.g. it is 16 years in the UK. The game is currently available to players in Andorra, Austria, Belgium, France, Ireland, Liechtenstein, Luxembourg, Monaco, Portugal, Spain, Switzerland and the United Kingdom. The booster fund is available to contribute to the jackpot, for example to boost the initial jackpot in a sequence of growing jackpots. The amount utilized each week is determined in advance by the participating lotteries. The odds of getting none of the 50 main balls but getting both lucky stars is approximately 1 in 95. This means that it is less likely than getting 2 main balls and one lucky star (1 in 46). However, there is no prize for only getting 2 lucky stars. 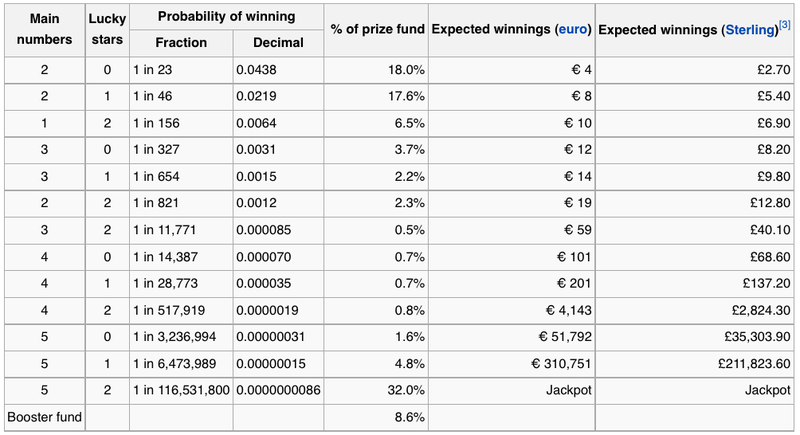 As of May 10, 2011, 8.6% of the prize fund is allocated to a "Booster Fund" which can be used to boost the jackpot prize. If the Jackpot is not won, it rolls over to the following week. Effective November 7, 2009 new rules were put in place regarding rollovers. The new rules introduce the Jackpot Pool Cap. The jackpot will continue to rollover until the Jackpot reaches or exceeds €185,000,000, the Jackpot will remain at €185,000,000 and any additional prize money rolled over will be added to the jackpot pool for the next lower prize level containing at least 1 winner (5 main numbers + 1 Lucky Star or possibly even just 5 main numbers). 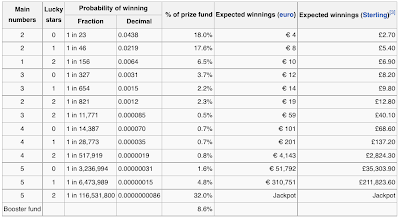 A new rule change of 12 January 2012 locks the Jackpot cap at €190,000,000 permanently and if the jackpot is not won after two draws, the prize money will be distributed amongst the winners at the next level. The participating national lotteries in the EuroMillions game have each established a EuroMillions Trust account. This is used for the settlement of all amounts due and for holding amounts in respect of future prizes. This trust arrangement protects the participating lotteries between them from a default from one of the national companies and ultimately the players interests. Super Draws and Event draws are special drawings when the Jackpot is set to a guaranteed amount (often €100 million or €130 million at times), regardless of the expected Jackpot. The difference being that a Super Draw jackpot will roll over to the next drawing if not won but an Event Draw jackpot will be distributed amongst the winners in the next lower tier (i.e. match 5 + 1). 9 February 2007 (€100 million). In June 2007, with the success of the main EuroMillions game, the Irish National Lottery launched EuroMillions Plus. For an extra €1 per line, players could enter the additional draw with the top prize each week of €500,000. Sales of the main EuroMillions in Ireland for 2006 were over €145 million; this success led to the introduction of 'Plus'. Portugal followed Ireland in the middle of 2009. Since November 2009 at least one UK player every week has won a guaranteed million Pounds Sterling. With the introduction of the Tuesday EuroMillions Draw on Tuesday 10 May 2011 there are now 2 Millionaire Raffle winners each week. 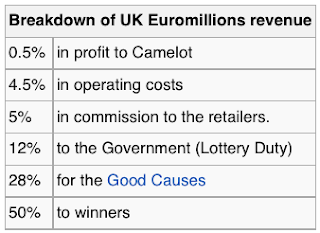 On Christmas Eve 2010 (Friday, 24 December 2010) the UK Millionaire Raffle was increased to 25 winners in one evening, on Tuesday 7 June 2011, there were 15 winners. The chances of winning the UK Millionaire Raffle game on a Tuesday can be estimated as 1 in 3,500,000. On a Friday, it can be calculated as 1 in 9,200,000. Winning in this game depends greatly on the number of the playslips sold. Prices per line in the UK increased by 50 pence to £2.00. The 50 pence was added due to weak exchange rates between the Pound & Euro and to cover the expense of the new Millionaire Raffle. Millionaires Month runs from November 25, 2011 through to December 23, 2011, this is where 50 UK Millionaire Raffle winners are announced over a month long promotion. The Millionaires Month promotion is the biggest ever Millionaire Raffle event to-date. On Friday 25 November 2011 the first 18 millionaires were made. Another 7 were made between Tuesday 29 November 2011 and Tuesday 20 December 2011. On Friday 23 December 2011 the last 25 millionaires were made. In June 2009, a Belgian newspaper claimed the National Lottery made up the profiles it announces of the EuroMillions winners. The names of Belgian winners are not normally released, except for a summary profile such as "a woman in her forties with two children." The newspaper claimed these profiles were entirely made up for commercial reasons, to make them more identifiable to the majority of players. For example, one winner who was an elderly woman from Blankenberge was turned into "a family with three children from Gent." A high-placed former employee claimed he was ordered to make up the profiles, while the directors of the lottery claimed no such order was ever given. Simultaneously, there were claims that the National Lottery had covered up a major case of fraud in which sellers of tickets had swapped winning tickets for losing ones, keeping the earnings to themselves; though it was not clear whether this involved any winning EuroMillions tickets as well. The National Lottery admitted there was such a case of fraud, but said it was a very minor case only involving a single ticket worth 2.5 EUR.